In case an organization’s administrator invites you to sign up and gain access to their company’s account, you will receive an invitation e-mail. Once you click on the unique link found in the email, you will be transferred to the invitation page, as shown in the picture below. On this page, you will notice the invitee’s full name and the organization which you have been invited to join, as well. If you decide to accept the invitation, you should choose whether you want to login with an existing or a new user. If you already have a email /password set with which you manage another company, you may use it for the new organization as well. Here, you can enter your login credentials and click on "Sign in and accept" to complete the process. 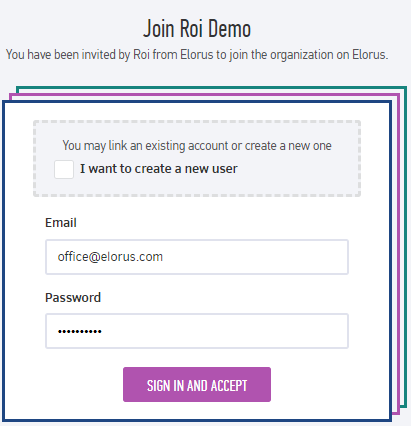 This way it’s not necessary to keep separate Elorus accounts for each company you are a member to. 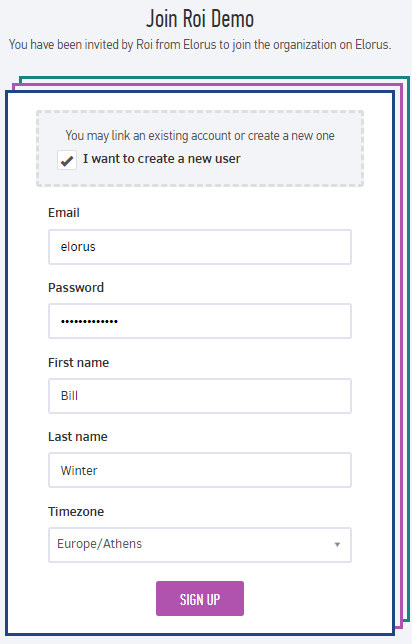 In the case of a new member you should check the option "I want to create a new user". Then, you will need to fill in your email, password and name and preferred time zone . > You can use Elorus with a different email than the one you received the invitation to. To complete the process you will have to click on the “Sign up” button at the bottom of the page.